McCann Manchester's Aldi campaign continues to resonate with viewers. 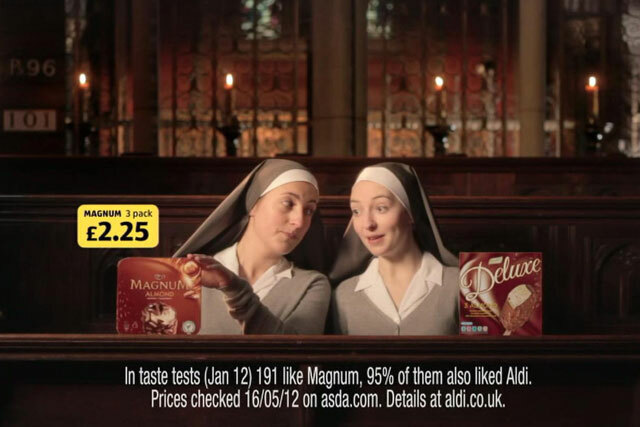 Its "nuns" execution was the most-recalled spot of June while also featuring among viewers' most-liked ads, according to data from Nielsen and NM Incite. The most-liked TV ad was Comparethemarket.com's "circus" by VCCP, with a score that suggests it was liked twice as much as the average new TV ad in June. Bartle Bogle Hegarty's "home advantage" spot for British Airways, featuring a plane apparently travelling by road to the Olympic Stadium, was the most-discussed ad online, accounting for close to 10 per cent of all online discussions about new TV commercials. The "most-remembered" score is the percentage of viewers who can recall within 24 hours the storyline of an ad. These scores are indexed against a mean score for all new ads, with 100 representing the mean. The "most-liked" score is the percentage of viewers who liked a spot indexed against the mean score of 100. 4 B&Q 139 4 Kellogg Special K 137 4 Gocompare.